Jill McDonald is a Scottish illustrator who loves pretty much every aspect of design, from drawing to screen printing, woodwork to graphic design, lithography to photography and everything in between. 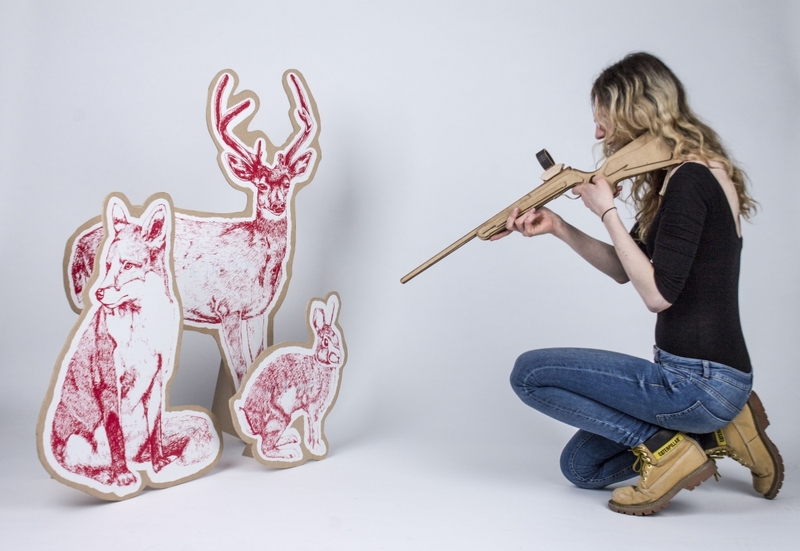 With this particular piece, her anti-hunting installation, it features three wood-cut, screen-printed animals and a laser-cut gun – all to engage the viewer and provoke a sense of responsibility toward the animals. What's more interesting, is when the red sight on the gun is pointed toward the animals it reveals hidden text which spells out things like “not a trophy” (for the deer) and “not a scarf” (for the fox). Discover more of Jill's work at www.jillmcdonald.co.uk.